Peter Brown, author of You Will Be My Friend and Children Make Terrible Pets, has written a new book that was a big success with my kindergarten students. Ms. Kirby is always yelling at Bobby, especially when Bobby flies paper airplanes in class. Ms. Kirby stomps, and she roars. 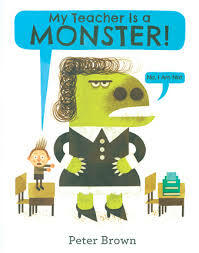 Ms. Kirby even looks just like a monster. Bobby runs into Ms. Kirby sitting on a bench reading a book. Not knowing quite what to do, and feeling awkward, Bobby sits next to her on the bench. Suddenly, a gust of wind blows Ms. Kirby’s favorite hat off her head. Bobby runs to catch Ms. Kirby’s hat. Ms. Kirby is so grateful to Bobby that she thanks him and then shows him how she likes to quack with the ducks at the park. Bobby decides to show Ms. Kirby his favorite part of the park. Sitting at the top of a hill in the park, Ms. Kirby has an idea. She pulls out a piece of paper and gives it to Bobby. Bobby quickly folds it into an airplane and launches it. It’s the best paper airplane flight ever. Bobby and Ms. Kirby each decide the other is not so terrible. In fact, Ms. Kirby starts looking like an actual teacher, instead of a monster. It’s a great resolution…until Bobby throws a paper airplane in class. I love Peter Brown’s dedication, “To misunderstood teachers and their misunderstood students.” Have fun with this one!